This post is in partnership with Cost Plus World Market, a brand I love. All opinions and excitement are my own. As a mother of four, at times I’ve struggled with how to put the mess of toys kids leave tossed everywhere inside the house, laundry piles that are a mile high and random knick-knacks strewn across all tables inside the house while trying to “keep up” our home. Sometimes, it feels like it is hard to find an aesthetically-pleasing way to store all of this while still making a home livable. I’m sure you share the same family growing pains! Fear no more! 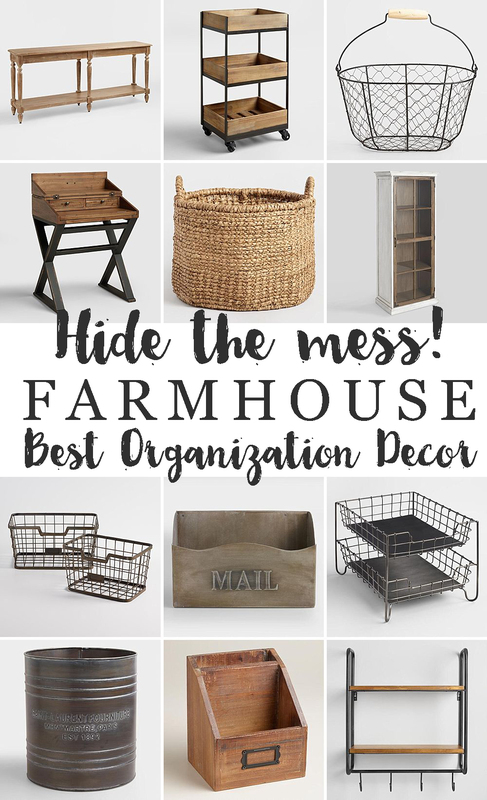 I’m sharing some real, life organization solutions that include an ultimate roundup of rustic farmhouse bins and cottage style baskets perfect for organizing every room to cleverly tame the mess quickly and easily. From small space storage to rolling cart storage, there is an organization solution for any space! I’m sticking to my love of neutrals and creams mixed with lots of soft textiles and versatile accessories. 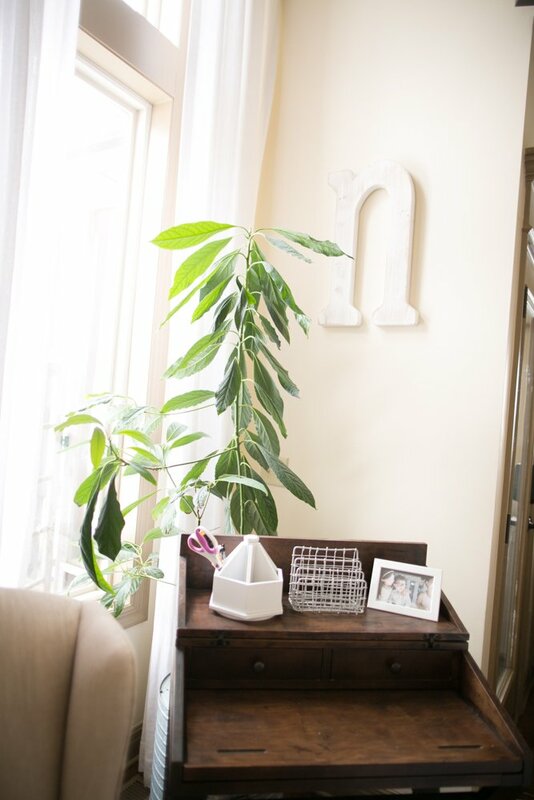 To me, this sets the tone for a very casual, super welcoming and most of all, livable space. It’s where a small cottage meets a rustic farmhouse! 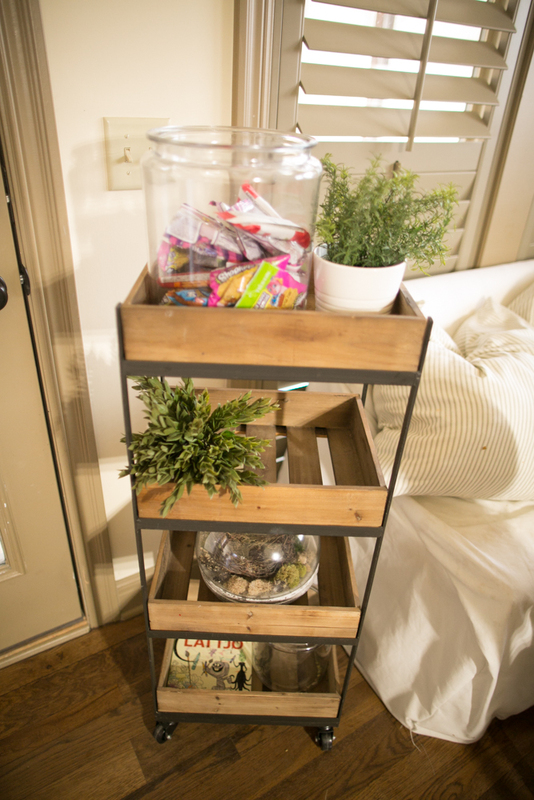 In the living room, use baskets as a quick way to hide toys. I use two coordinating baskets with lids as a coffee table. 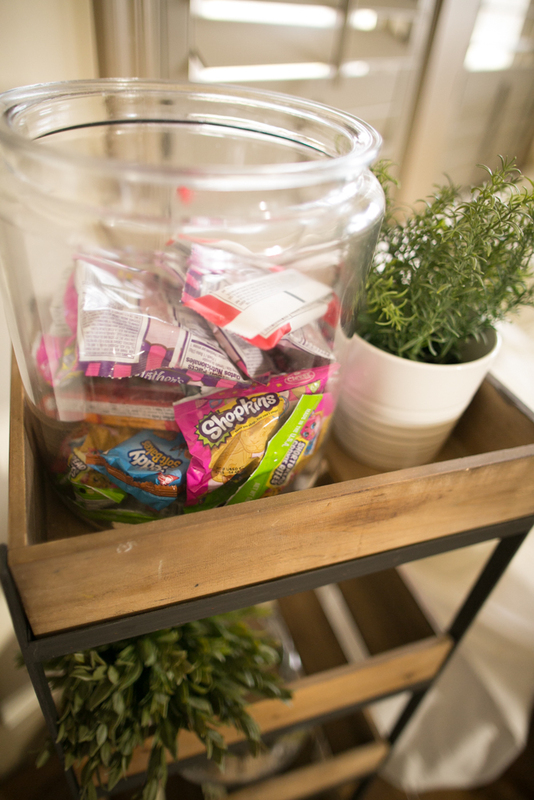 When we have guests over or it’s bedtime, I can quickly put them away by throwing them in these baskets. 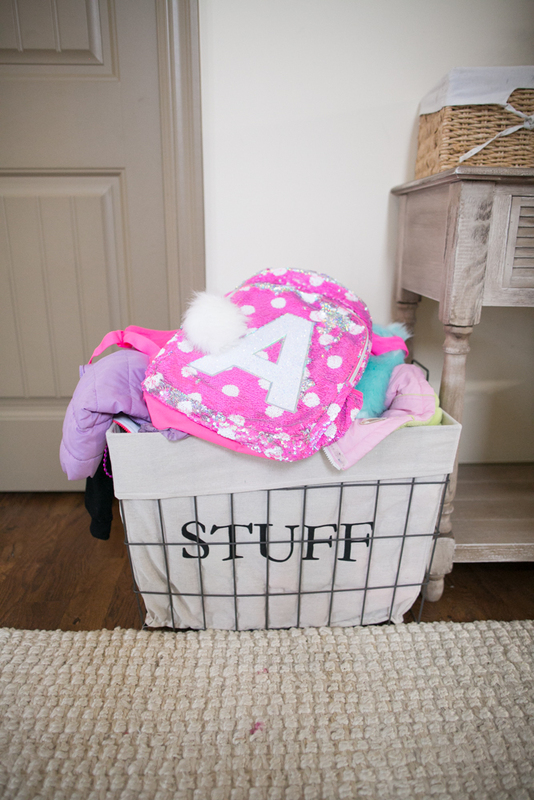 Anything in this basket I know I will need to organize later in the playroom! It’s not only beautiful, but also very functional. Hidden desk space in common areas. I have a secretary’s desk in our master bedroom and in our living room. Most secretary’s desk come with a way to close up the space to hide the junk. The one in our living room is from World Market and I can close the lid to transform it into a side table. It’s pretty slick. The secretary’s desk in our master bedroom acts like a nightstand. This allows me close the lid when I’m done working, close the lid to hide my mess and hop into bed! Use the guest bathroom sink storage to hide extra diapers and wipes on the go. With two littles still in diapers, I pretty much need them stashed in convenient spaces both upstairs and downstairs. I love using wire storage underneath the sink for baby supplies on the go. Utility and bar carts. 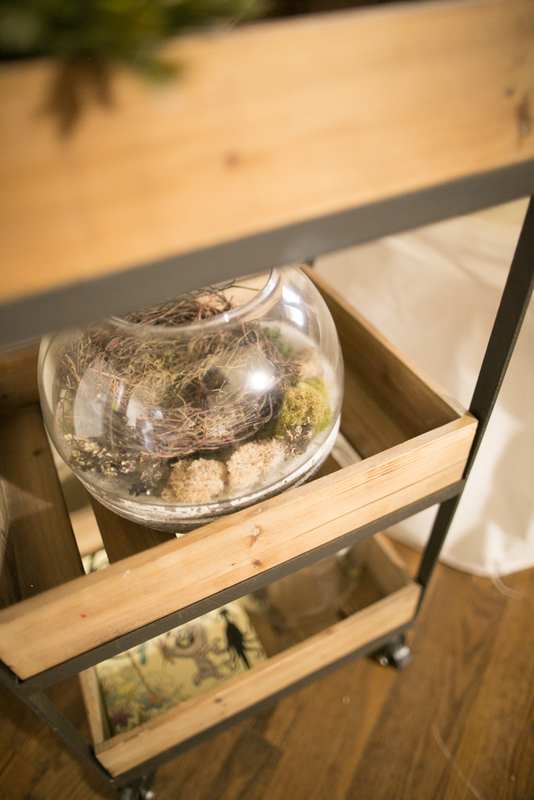 I love having carts around for either decor space or for usable storage! I repurpose these rolling carts fairly often. One year, it was to hold all of our sippy cups. As they grew out of it, it turned into an art station. Then it went back to a bottle station when we had our fourth. 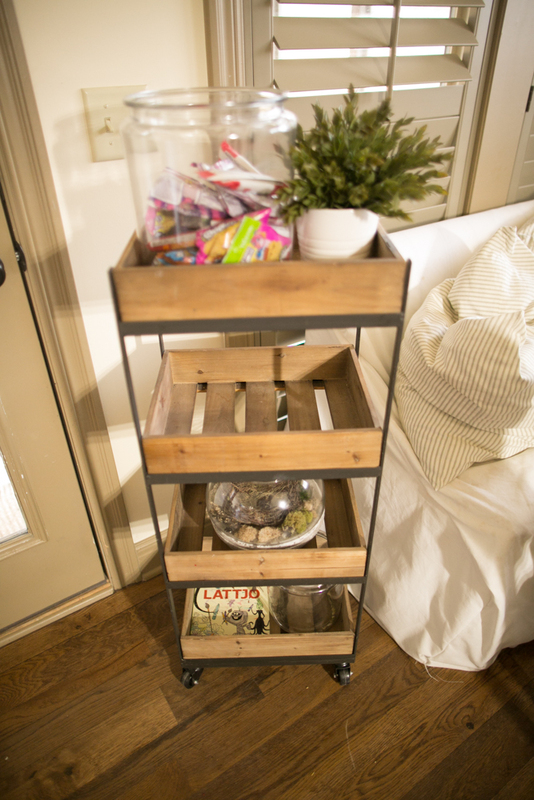 Having these cute, rustic style rolling carts around made things so much easier to organize (and repurpose as your needs change). Every school bag and equipment has a place. I use large wire baskets lined with fabric to store our kids extracurricular activity equipment and outfits by sport in the foyer. It makes it so easy for them just to “throw” into the basket so I’m not having to hunt them down for the next practice or game. This big one is used to store all of their backpack and daily coats in the winter when we are heading out. Lord knows my kids who are all six and under will not hang their jackets up. This makes it easy! Sofa table. I absolutely love my Everett table from World Market! I love the rustic look and how much room it gives me to decorate and store underneath. 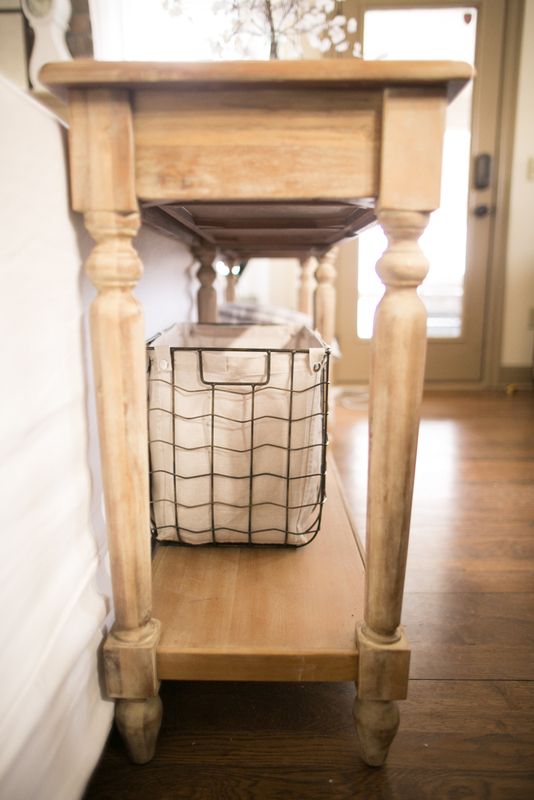 I love putting baskets to store things from view as well as store extra blankets and pillows underneath! 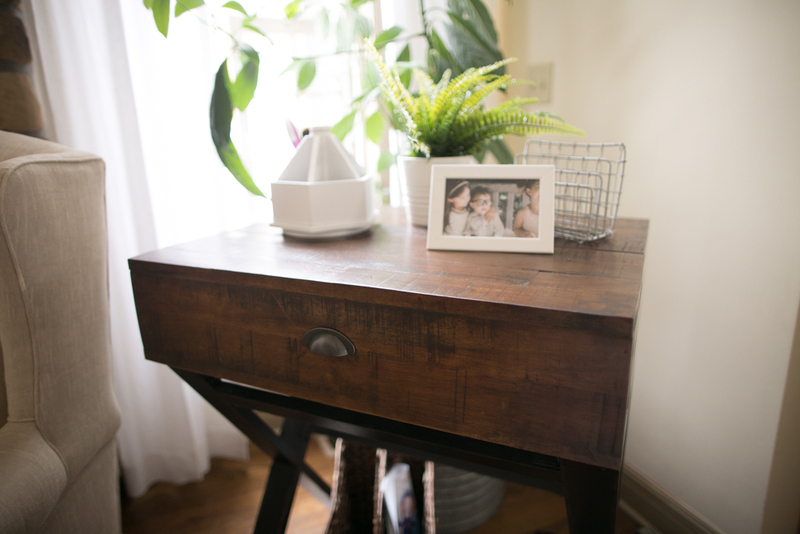 Our kids love taking out our blankets and pillows to build forts on any given day, so I love that this sofa table provides me ample room to stash all of it. 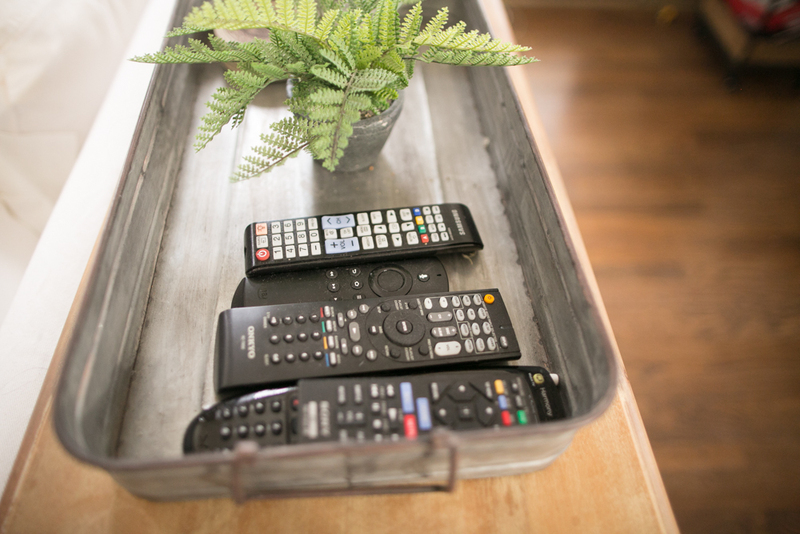 On top of it, I have a galvanized tray where we store all of our remotes! Baskets in all the right places. I have a lot of baskets. It’s kind of like an obsession. They hide things so well! 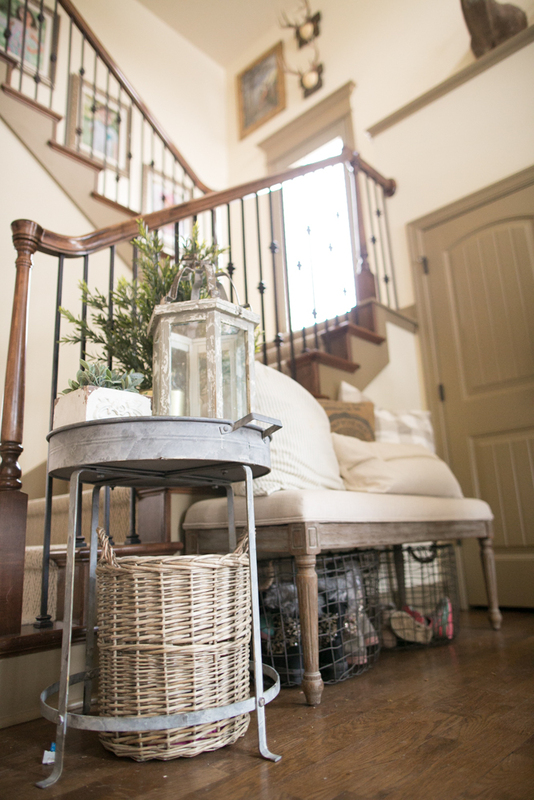 Tote baskets are also amazing to havin the living room, foyer and bedroom. 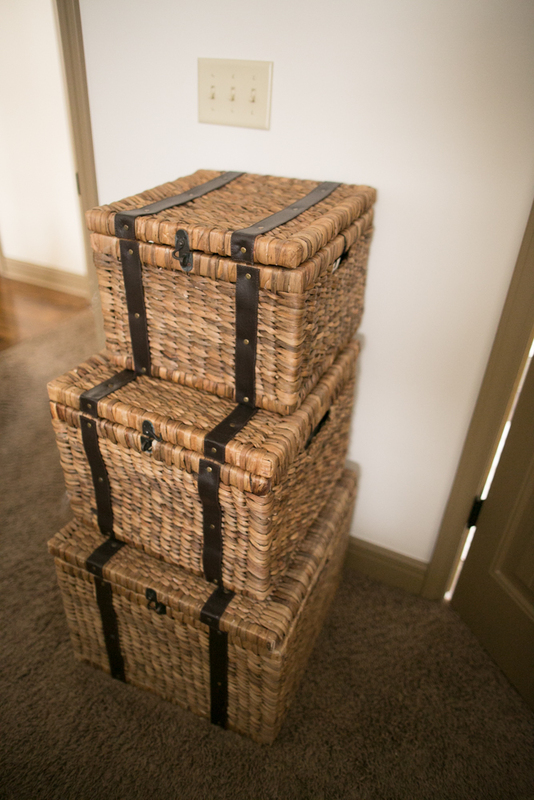 I stacked three similar ones in our bedroom – each one is hiding clothes for each of my kids because they love getting dressed in OUR bedroom. It’s kind of ridiculous. 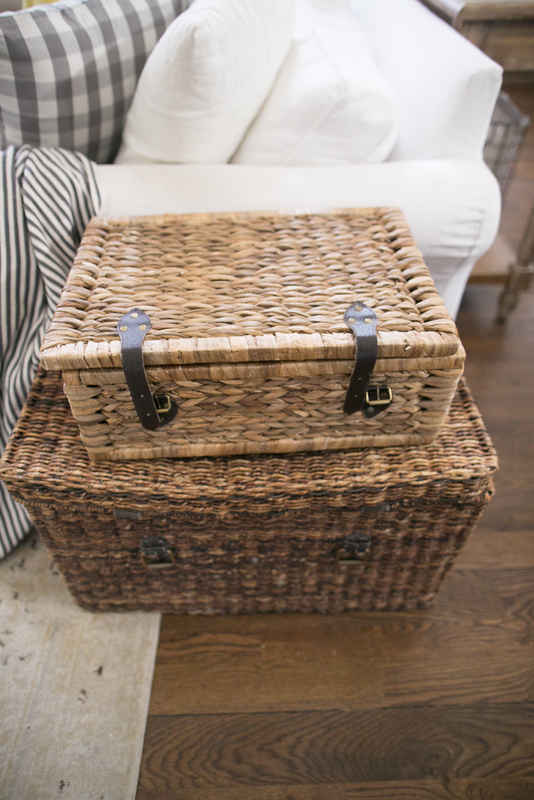 The round tote basket allows me to store all of our throws and pillows for our weekly movie night! 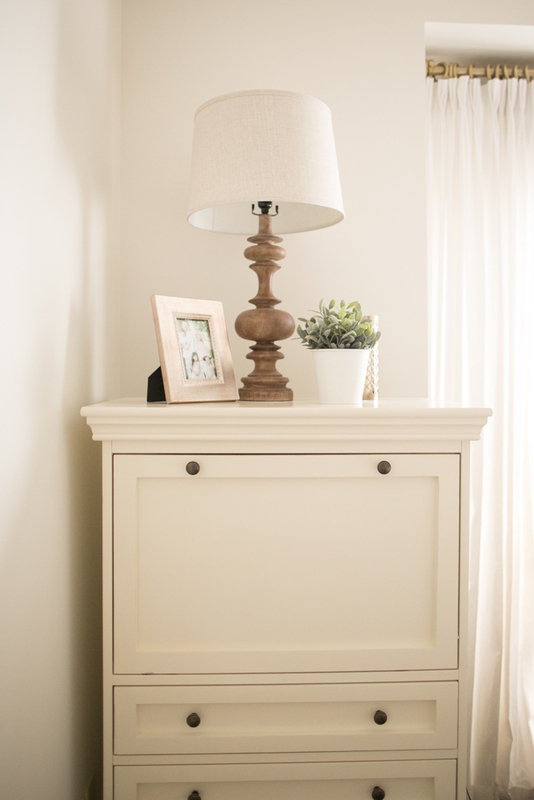 Entryway Bench. 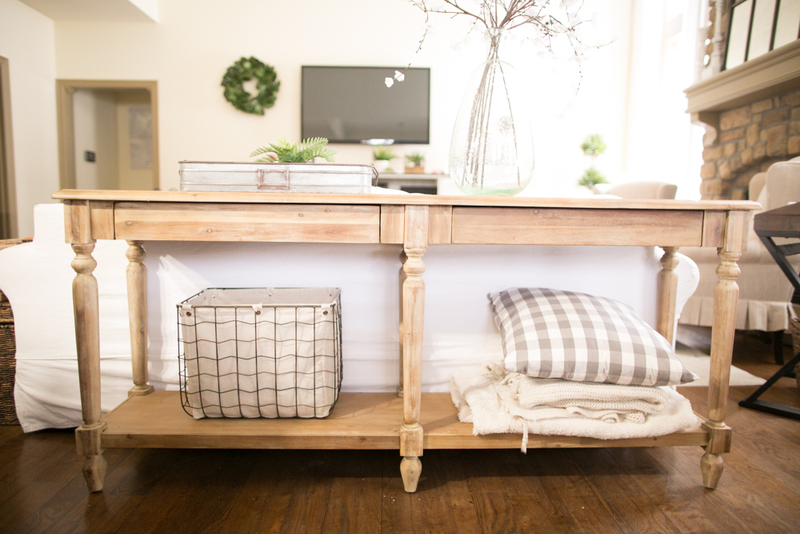 The entry way is an easy place to put a bench with storage! Cabinet for routers and modems. 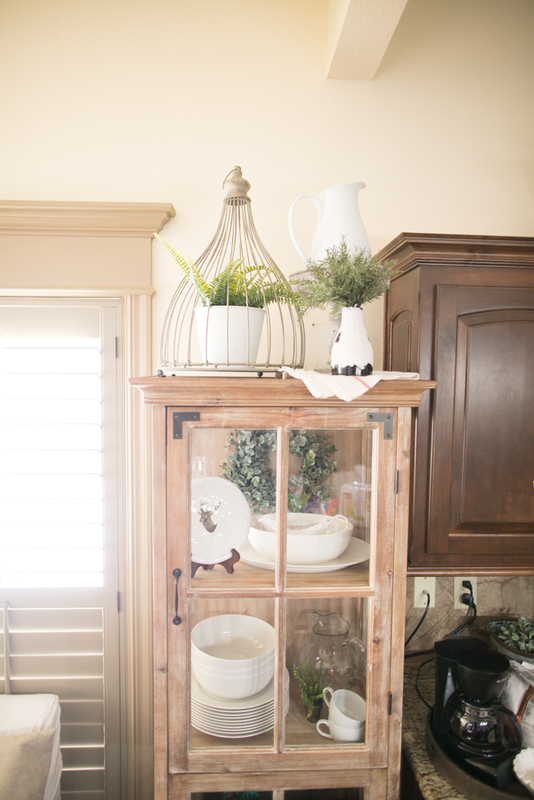 We got this gorgeous curio cabinet that fit perfectly in a very narrow nook in our kitchen. I store my guest dishes and plates in the upper section, which is the part you typically see when you walk by. 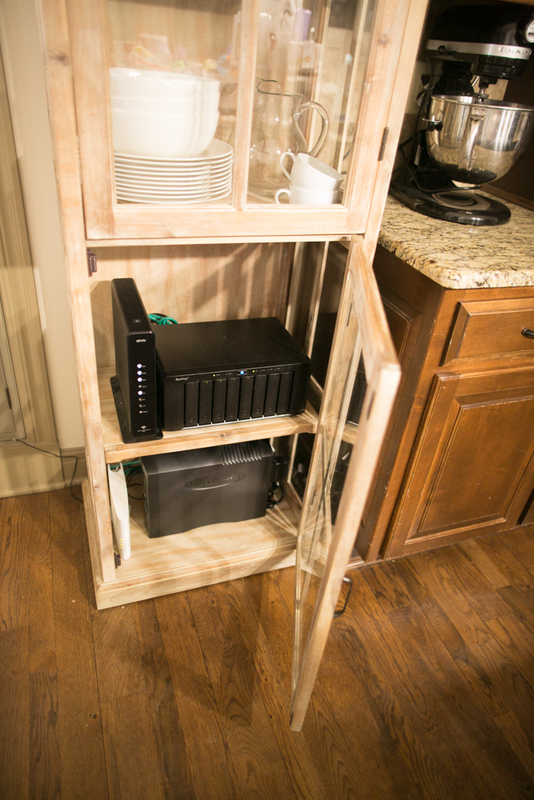 Most people have routers and cables where their television set is, but our routers and network storage devices are located near the kitchen. So we just placed it in the bottom section of the curio cabinet. As an adult, I know there’s a balance between having things in their place and a space for my children to let their imagination run free. 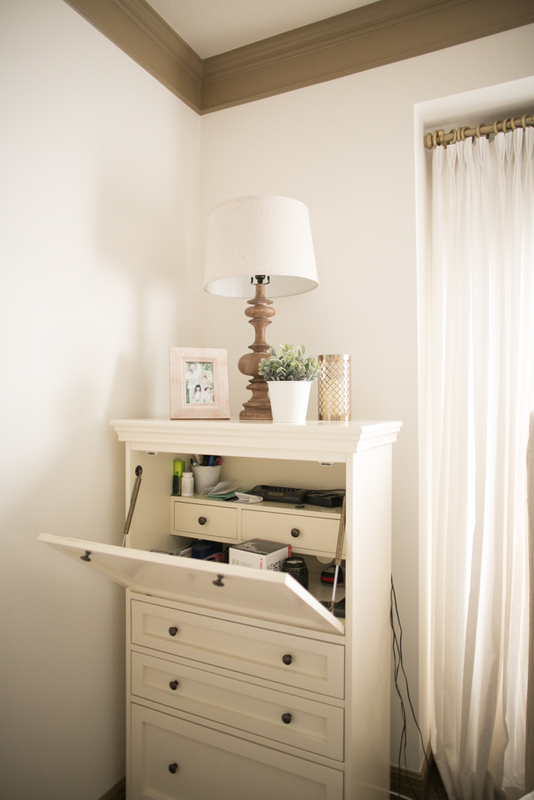 Creating an organized, pretty and happy home doesn’t mean it can’t be lived in. I hope these ten ways inspired you in achieving this delicate balance and the ability to tame the kid-nado in your home! 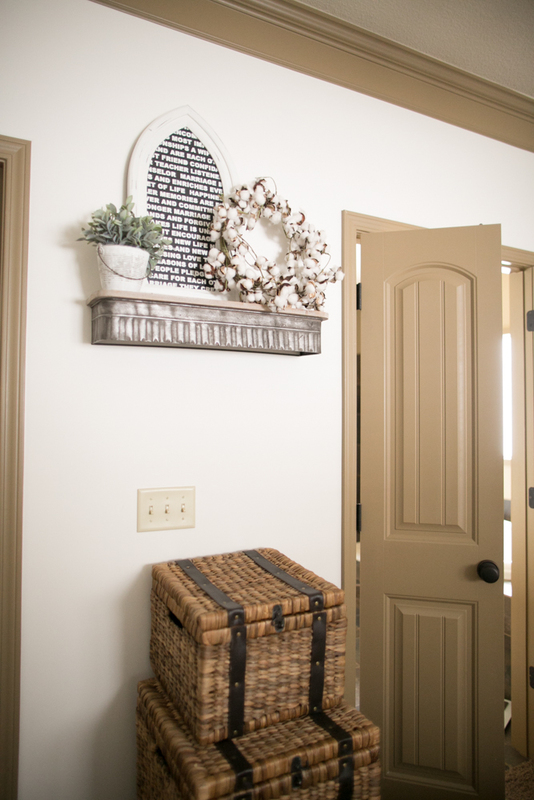 Check out this farmhouse style organization bin and basket round up for more inspiration. Pin the image below for future inspiration.